Sunday Feast Recordings - March 28, 2010 ~ The Toronto Hare Krishna Temple! 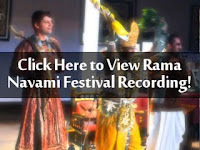 The recording for this week's Sunday Feast, featuring Rama Navami festivities can be viewed by clicking the image below. As a reminder, the recordings from our weekly live web broadcasts are stored on our ISKCON Toronto Video Archive Blog.